Choose from a variety of MOUTH WATERING Flavours. PURE WHEY PROTEIN – 100% pure premium whey protein. Natural, Fast acting protein, enriched with PHARMA Grade Protein. Low in carbs, Low in Fat. Increase Recovery time super fast. Increase lean muscle mass gains instantly. ULTRA LOW in FAT and SUGAR – 100% NATURAL – No artificial colours or sweeteners, LA Whey Gold contains Stevia, instead of sucralose. LIFETIME GUARANTEE: Risk free purchase. Get your money back if you don’t notice the results, NO QUESTIONS ASKED. 100% natural whey protein with NO artificial ingredients nor ingredients. Does not cause bloating. Great for those who are lactose intolerant. 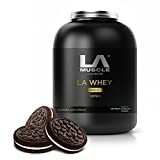 LA Whey protein contains 49 grams of protein per serving and is low in carbs and fat, LA Whey protein helps with muscle mass growth, muscle recovery as well as aiding muscle repair. Take a serving immediacy after your workouts for best results.